Good news for the Purple Line Extension and the Regional Connector, the pair of Metro projects slated to receive money this fiscal year from the federal New Starts program. The projects are set to receive $65 million each in the 2014 fiscal year. New Starts helps local transit agencies fund large projects and Congress appears set to fund New Starts for fiscal year 2014. The federal program is currently helping to fund over two dozen projects around the United States. New Starts is also an annual target for some critics, so it’s good to hear that it is being fully funded in fiscal year 2014. Overall, the Purple Line Extension’s first phase is due to receive about $1.25 billion and the Connector $675 million in New Starts money. Both projects are also receiving money from Measure R, the half-cent sales tax increase approved by L.A. County voters in 2008, as well as a federally-backed loan program called TIFIA. The cost of planning and construction of the first phase of the Purple Line is budgeted at $2.86 billion while planning and construction of the Regional Connector is budgeted at $1.42 billion. The New Starts money is awarded to transit agencies on an annual basis — the money isn’t awarded all at once, thus the reason that both the Purple Line Extension and Regional Connector are set to each $65 million in this fiscal year’s spending bill. CAPITAL INVESTMENT GRANTS – The bill appropriates $1,942,938,000 for new fixed-guideway projects. Combined with available prior year transit funds, a total of $2,132,000,000 is available for new start activities. This level of funding is adequate to fully fund the President’s Fiscal Year 2014 Budget request of $65 million for the Purple Line Extension and $65 million for the Regional Connector. The bill issued this evening also increases funding for the U.S. Department of Transportation’s popular TIGER grant program to $600 million, an increase of $100 million over last year. 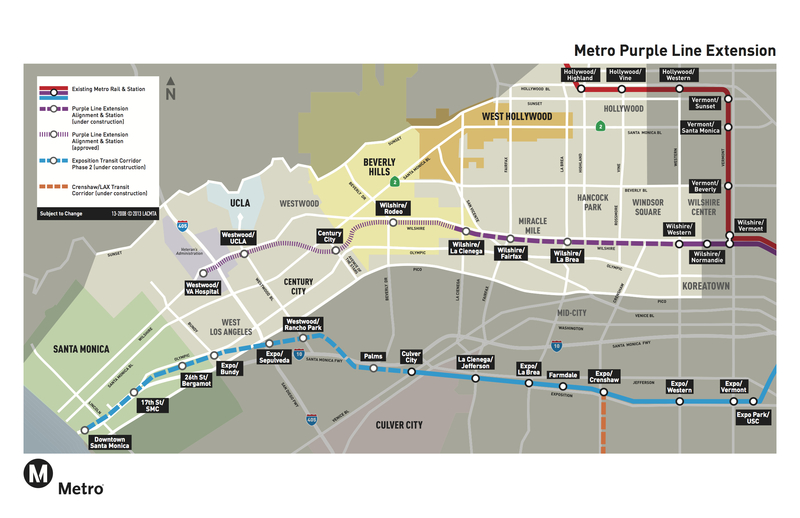 And here are the New Starts project profiles for both the Purple Line Extension and the Regional Connector. When will the construction contracts be handed out? Metro Board still has to consider contracts for both; I believe they’re scheduled to do so later this year. And this is not for a story, just curiosity. Awesome! Lets add a tax measure to expedite the process. Perhaps entertaining the idea of both a day and a night shift can cut the length of construction in half. Could a day and night shift reduce construction time or is that pie-in-the-sky wishful thinking? A tax increase will not be popular in the valleys. An extension of the existing tax might squeak by the 2/3 required. An additional tax would likely fail. The Westside (and East L.A.) would have had their subway by now if the Westside political machine wouldn’t have blocked it 20 years ago. Now they will have to wait in line while other parts of the county get the projects they supported. 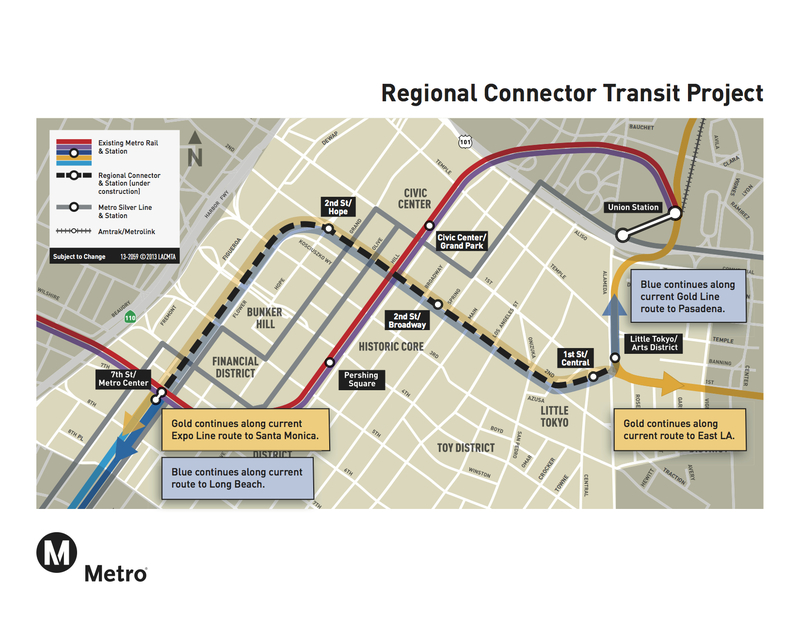 For a short line, the time to build the Regional Connector seems like a long time. Can’t Metro speed up the process? Remember, Warren, the Regional Connector is a subway project, and it has to be deep enough to avoid disturbances at the Music Center (and especially at Disney Hall). Compare the SF Muni’s Central Subway project. The moles are already in the ground; Mom Chung has chewed her way under Market Street (below the existing Muni and BART subways), and Big Alma is (as of the last time their map was updated) only a few blocks short of doing so. They are expected to arrive at the retrieval shaft (currently being dug on the site of the former Pagoda Palace, several blocks past the northernmost station planned for the line) later this year. Yet they don’t expect to have it ready for revenue service until 2019. The moles that will be digging the Regional Connector haven’t even been built yet.